You will earn 4,110 Reward Points. Earn 1 reward point for every 1 dollar spent. Three stroke lengths: 1⁄3, 2⁄3 and full stroke. Automatic operation in three speeds: 20, 40 or 60 slices/minute. 1-speed, 1⁄2 HP, permanently lubricated ball bearing knife motor with thermal protection. 13" (330 mm) diameter, hollow ground, hardened and polished forged stainless steel knife. Variable pitch barrel cam for ultra fine, precise slice adjustment to a thickness of 15⁄16" (34 mm). Articulating and full length rear mounted meat pusher to secure and advance products evenly, fence to hold product during automatic operation. Rounds up to 8 1⁄2" (220 mm) diameter. Cutting Capacity: Shown in chart below. Warranty: Parts, labor and travel coverage for one year, exclusive of wear items. No-volt Release: Requires restarting the slicer in the event of a power interruption. Electrical: Furnished in 120/60/1, 8 amps, AC, ETL Listed, with 3-wire cord and plug. Knife: 13" (330 mm) diameter, hollow ground, hardened and polished stainless steel. Knife Ring Guard: Permanent tapered guard covers the non-slicing portion of the knife edge. Controls: Sealed push-button switches located on the index knob housing out of the drip zone. Kick Stand: An easy to use kick stand supports the slicer for easy access to clean under the slicer. Product Table: Full gravity feed 45° angle with articulating rear mounted pusher that runs the entire length of the table to secure product for increased yield and consistency in every slice. A fence provides stability for the product in automatic mode. Knife Sharpener: Removable and submersible table mounted, two stone, dual action design to ensure correct pressure and contact angle are always applied, thus reducing knife wear and delivering a perfect edge. Borazon stones last longer, sharpen faster and clean easier. Finish/Construction: Base, product table, pusher, support arm and upper housing are constructed of NSF approved, engineered polymers reducing the number of seams. Gauge plate and center plate are anodized aluminum. All controls are sealed and located out of the drip zone. Motor: Knife motor is 1-speed, 1⁄2 HP totally enclosed and permanently lubricated ball bearings, thermally protected. Table motor is brushless DC providing three fixed speeds, 20, 40 or 60 slices per minute. Three stroke lengths in the automatic mode, provide more slices/minute at the same speed. Thickness Control: Index knob controls a precision, variable pitch barrel cam with ultra-fine adjustment in the first revolution and opens to a thickness of 15⁄16" (34 mm) for accurate and consistent slicing. This control is located out of the drip zone on the upper left to provide quick and easy access for operation and cleaning. 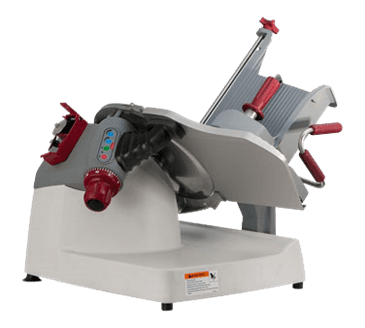 Berkel model X13AE-PLUS automatic gravity feed slicer offers a number of special features. A sanitary one piece engineered polymer base and product table reduces seams and joints while providing an NSF approved surface for easy, effective cleaning. A removable and submersible table mounted sharpener with borazon stones for accurate sharpening. Precise thickness control is achieved using a variable pitch barrel cam for fine adjustment and wafer thin slices. The index knob and operating controls are mounted outside of the drip zone for quick and easy access. The slicer can be automatically operated in three speeds, and with three different stroke lengths. A permanent ring guard protects the entire non-slicing portion of the knife during slicing and cleaning. A fence is included with the product table. An easy to use kick stand supports the slicer for easy access to clean under the slicer. Complies with NSF/ANSI Standard #8. When you need to slice a range of foods in a short period of time, Berkel X13AE-PLUS Premier Food Slicer is capable of getting the job done. This slicer is 28 inches wide and 30 inches deep.